Millennium Blades, when described, sounds like a game about to perform the most extravagant Shark Jumping ever. It’s a card game that seeks to simulate the length and breadth of Trading Card Games (henceforth referred to as TCG) ala Magic The Gathering complete with the buying of boosters building of decks and the tournament scene with its fluctuating strategies and meta. And not only that but to abstract all of that into an evening’s entertainment?? You’d be correct in thinking this is bonkers an impossible task, and that’s before you wrap your head around the fact that you’re playing a card game simulating playing a fictionalised trading card game how very meta. Or as Keanu Reeves put it in the Matrix Whoah! In this immense box of cards and there really are literally hundreds in here, at the end of a session you will have experienced the entirety of a TCG’s lifecycle concisely and majestically diluted into two hours. And as you push back your chair from the table your head swimming with the crazy goodness that you’ve just experienced, you’re left with but one defining thought, I really want to do that again. A game plays out over three tournaments, sandwiched between these are real time sessions of deck building, set collecting trading and selling. Besides the multitude of cards and illustrations each representing numerous sets and collections, there is also one of the greatest gaming components of modern times great big wads of cash to spend. These cash stacks thematically link beautifully to the idea of what you’re doing, and it becomes an addiction to be blowing huge wads on rare and super rare cards or just buying armfuls of boosters hoping that you’ll discover that one card that works in tandem with the deck you’re constructing. It’s like I’m that teenager again in the comic store for the first time tearing open foil packs hoping, praying like Charlie Bucket to find that super rare golden ticket. But I’m getting ahead of myself. Everyone gets a starter deck, it includes a deck box (of course) one accessory and eight single cards that to anyone familiar with TCG’s or deck builders work together in simple but effective synergies. As a starter game, it’s suggested, and I strongly agree that players play these decks to understand how the tournament works and also get a feel for how those cards play. It is from this humble beginning you can adapt your strategy and build on this to engineer bigger and better combinations for the next tournament not forgetting the cards your opponents played and working on a strategy to immobilise their scores. The tournament is abstracted down to playing six of your eight cards that will either include SCORE options that offer points or multipliers at the end of the tourney dependent on the Types/Elements remaining face up in your tableau. There are also ACTION cards that will allow you to FLIP your cards for points or to activate further combos or other ways of manipulating your score or your opponents. Or you can CLASH a simple mechanic that involves comparing the points values of the two battling cards, with again some cards adding points for winners or losers. It’s not incredibly deep but when combined with the sheer variety of different combinations and builds offered by the vast number of cards available still manages to be massively satisfying. And as much fun as these tournaments are the timed stages are where the magic and happy embolisms happen. The deck building phase is split into three timed intervals the first two are each 7 minutes in length at the beginning of these you get 6 cards for free, and then the timer starts, and you are free to buy boosters trade cards, build your decks and collections. During the first and second intervals, a meta card is revealed for additional bonus points available for you having a particular card type in your deck. The final 6 minutes period is used for everyone to try and get their house in order sort out the cards decide what’s going in the collection whats going on the deck. Before we jump back into the next tournament, you score your collection which is based on all the cards having a connecting element it’s a great way to offload any excess cards you’ve collected during the turn but also offers some serious points and is ignored at your peril. And then the player board is flipped, and the battle commences. The first round of this game and for some, the entire first play is a mind melting experience as you try to juggle improving your deck and wrapping your brain around just everything that is happening. The rules flat out tell you-you can’t do it all pick your battles, it’s an excellent piece of advice, any control freaks need not apply you’ll lose your mind trying to accomplish everything against the clock. Some have stated this is a heavy economic game, and while the spending and recouping of cash scouring the aftermarkets and emptying the store are certainly a massive chunk of what you’re doing it’s all leading you to build that perfect deck. You cannot underestimate the tournaments the points available for winning are essential to victory, so yeah the spending of your money and making every dollar count is a factor but don’t be deceived into thinking it’s all the game it’s not. So who is this for? Anyone with a TCG or LCG background are going to eat this up and will comfortably slip into the strategies and style of the game like it’s a pair of warm slippers. It might be a harder sell for those not accustomed to the scene although I’ve played with pals who’ve never picked up a collectable game in their lives and they enjoyed it for the deck building element and challenge of the tournament play. You get an enormous amount of value in this box, aside from the 6 starter decks and the 118 card core deck an additional 29 sets allow for multiple store configurations. Then there are the player powers, pro player powers, rule’s variants for the buying and selling of cards, super powerful accessories and even the opportunity to play each tournament at different venues with separate rules and effects. There’s an exhaustive amount of content in this box you could literally play this for years before ever experiencing everything. If this is going to fall flat it’s going to be players who haven’t experienced TCG play, it can for the first time be an intimidating experience, and I know some players who absolutely cannot cope with the pressure of real time play. The rules are fast and loose with how long you give to these sections, however, it’s more to stop games rolling for hours than anything else. If you don’t pre-build the store decks before a game then you’re looking at a healthy amount of time shuffling those cards, my advice is to choose ahead of time and keep the same deck for a few games before you think about mixing things up. And those lovely bundles of cash, yeah set aside a couple of hours to wrap all of that together before you can play, but then that’s why God invented Netflix right. If you’ve ever enjoyed the buzz of opening foil packets, collecting sets, trading cards with friends or playing in a competitive card game then this is a direct line back to the soul of that 12-year-old in all of us geeks, it’s ridiculously wild fun the work of a deranged genius. The fact that not only does it accomplish all it set out to do but does so in the most infectiously enjoyable way makes this a contender for me of my game of the year 2016. The hype train is pulling into the station and it’s : MILLENNIUM BLADES! Level 99, known for their ambitious overages, decided to create a faux thousand year old CCG to rival The Magic and The Poke, but didn’t. They went a step further and created a game about playing a faux thousand year old CCG by playing it, but not. The result is a ‘best of’ Millennium Blades in one big box. No commons. No fillers. No swamps. It’s bursting with professional tournament heavy hitters. It’s a board game that’s a card game that simulates a collectible card game. In fact- it simulates CCG Life. Millennium Blades simulates the CCG world from booster buying and deck tinkering through tournament play with gratifying sweeps and agonizing defeats. The game plays in about two hours through 3 repetitions of two distinct phases: The Deck Building Phase(A real time – dare I say it – ‘Card Gathering’ round) and The Tournament Phase(A mechanically simple yet deep and puzzley tableau card play round). Before getting into the gist and gel of the phases, let’s talk about The BLADES DECK. Not a deck. Not your deck. Millennium Blades is a card game about cards. A lot of cards. A capital D-E-C-K deck. The true centerpiece of Millennium Blades is the BLADES DECK. This main deck is composed of a foundation of 118 Core cards (solid anchor cards, tournament advantage accessories, and the rare gem of a find) shuffled with 12 swappable mini decks of 12 cards representing boosters and expansions (decks focusing on various mechanics and themes). A monolith of 250+ cards sitting smack dab in the center of the table. How does one purchase, ponder, and paw through all that card stock? The deck building phase is a real-time phase of 20 minutes broken into shifts of 7, 7, and 6 minutes where players can take any action they want, as much or as little as they see fit, until time runs out. You have oodles of options in those 20 minutes which paradoxically seems like plenty of time and feels like not enough. There’s plenty of chaos as time ticks down and you’re trying to cobble together some order in constructing a tournament ready deck. Hit the AFTERMARKET and sell that useless bit of cardage for some quick cashola. While you are there, make sure to peruse the face up throwaways from other players. You know what you are getting here and they may have foolishly put up for sale exactly what you need. Or perhaps they are holding a card most useful and with a smile, a little coercion, and coinage you can make a trade. Tuck away those ‘maybe usefuls’ in your Binder card pool for later. Have you been accumulating a little too much starchy cardboard fat? Burn away your excess by building a Set Collection for some spare endgame VP or fuse a wad of cards into a draw from those tempting promos decks. The clock’s ticking – but there’s time to buy one more card, right? Wait! Why am I standing here typing at you?!! Time to make the best of what you’ve got. We’ve all heard of the calm before the storm. There is none in Millennium Blades. The deck building phase is a real time physical storm of card grabbing and deck building. It is a mental storm of trying to figure out what you want to do later in the tournament while doing a bunch of sifting and organizing in the now. Deck building is the Chaotic Storm. The tournament is the calmer storm after the storm. Players take 8 card ‘singles’ (6 to normally play – 2 for just-in-case back up plans), a Deck Box, and two Accessories and sit down to a calm and orderly turn by turn game of Tournament Simulation. All the rules you need are there on the cards. If the deck building phase is about grabbing cards, the tournament is about grabbing Ranking Points. Massive amounts of Ranking Points gained through combos, chains, and slick card play. Those sweet, sweet rankings are what being a Blader is all about. And all this comes down to playing six cards, turn by turn, in a tableau and utilizing their own card effects in the best possible way. Some of the main effects to consider are PLAY, FLIP, SCORE, and ACTION. PLAY effects take place as soon as your card hits the tableau. FLIP effects happen if somehow the card turns face down through other effects. Flipped cards are considered textless, attributeless dead placeholders. SCORE effects enter play come the tournament end, so long as that card remains face up, of course. And ACTION – well – we find ourselves at that if-you-choose crossroads I mentioned above. Flipping an ACTION card face down activates the effect while blanking the card out. Have a SCORE card granting RPs for every Dark symbol come tournament end and an ACTION card with said Dark symbol? It’s time to weigh plusses and minuses against RPs. There are also cards granting ONGOING effects as long as they remain unflipped. TOP cards have power throughout rounds as long as they stay the face up card closest to the front of your tableau parade. Your front cards may CLASH with opponents or you can REACT to stop an opponent’s savvy move dead in its tracks. From the Storm of Chaos came 6 proud cards, jigsawed together into combos and power plays. Literally, it’s about playing your cards right. Oh – and those massive amounts of RPs for doing so, of course. I really like this game and that should be fairly obvious. Umbrellas up for the positivity shower. I’ve played the game almost two dozen times with various gaming groups, CCG loving Magic Users and CCG avoiding Poke-nons alike. Many walked away wanting to play again for various reasons – most still seeking that ‘one last card’. However, these are my final thoughts – so enough of them, back to me. Millennium Blades is touted as ‘at its heart a Commodity Trading Game…’and there’s been some Talking Heads chattering away and tossing about the word ‘Economics’. If I squint really hard I can see that. Personally, I find all that buying and selling and trading not to be ‘stocky markety ‘ but ‘Ebay in the moment’. Unless you have something someone wants, you are probably going to wind up with less than you paid for. The buying and selling and burning cards for points and promos, I can’t help but peel away the veneer and see the man behind the curtain: a way of gaining and discarding cards. It isn’t quite deck drawing and it isn’t quite drafting. It’s a hybrid. It is clever, satisfying, downright brilliant fun, and CCG sims to a tee, but I am just not seeing the ‘stock’ in card stock. Accumulating Cold Card Cash isn’t getting you the bulk of your end game VPs, playing cards are what gets you there. I see the cards and plenty of them and that’s what I love. I told you that BLADES DECK was the centerpiece for me. Feel free to keep your Economics. I’m going to throw a few more E’s into the mix. All those little 12 card meta-boosters that get mixed into the monolithic deck – they all focus on different mechanics and thematics. Some protect your deck. Some destroy others. Some destroy your own tableau for the gamble on those massive Rankies. Some like to flip. Some challenge you to keep them steadfast to the end. They each favor and flavor some effect or aspect of tournament play. Figuring most people I was going to play the game with weren’t going to opt for a ‘sit around my kitchen table’ card study session like I had access to, I leveled the playing field. I studied the starter decks and some random cores for purposes of fielding questions, but I’ve been playing the boosters blind. The thrill of Exploring the decks and what they can or can’t do for my any-given-night’s play style and the Experimentation with different combinations of mechanical twists is a real high point in my book. The Evolution of this game works, like real evolution over time and without realization. Most of those ‘interesting potentials’ I slide into my binder in any given game get peeked at again once or twice, but never really see the light of play because I’m focused on what’s running hot for me at the moment and how to tweak it over the edge. A few games later I wish that binder was a reality because I don’t have the same cards and I’m cobbling together a new strategy and they would have been perfect. Dots get connected between games while still playing in the now. After half a dozen games with a dedicated group, you can almost hear the mental clicking and people begin asking for and desperately seeking “The Guy…you know the one who did the Thing”. I’m sure in time we’ll be playing like the Power Players we represent. The play’s the thing and it begins evolving. Keep your Economics. I’m in it for the Exploration, Experimentation, and Evolution . After a dozen plays I still feel like I am splashing my toes around in the card bath. 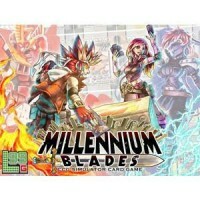 Millennium Blades for all its simulation and parodying of CCGs distills some of the best aspects of them in two hours…and across games. There does seem to be unspoken question or two whispered on the winds. As a CCG Sim, is Millennium Blades a game for CCGers? Personally – I don’t think so. I’ve never really played CCGs. I bought a Magic deck once – like you do – tried to fathom what this stack of cards had to do with the very tiny words on the fold out sheet of paper and gave up. A few people have tried to teach me since, but I tap out rather than tap mana. Pokemon was something crybaby boys cried about when their cards got stolen at summer camp. I just looked down and continued to eat my bologna sandwich quietly. The closest thing I have to a Perma-Deck in my game collection is a Mage Wars mini Trapper Keeper. So nope – CCGs are not my bag…errr…deck box. However, I do know CCC. I know people buy decks and boosters – metric tons of little tear open boosters. I know decks are built. There are tournaments. There are Sealed Deck events and The Swiss-es (Swissi?). I have seen tables of people with cards lined up edge to edge going at it. I know if you don’t have enough trolls or goblins or some sort of minions in front of you, your wizard gets sucker punched in the gut and you had better start turning mountains sideways for biblical Frosted Flakes. I know the players gotta play-play-play and Charlizards gotta char-char-char or do something burny I imagine. I know new cards and decks and sets come out every other day so the House of M can be fed. I know the guy who spent $500 on cards will most likely always win out over the guy who spent $5. I have a CC-Concept, even if I am not CC-Specific, as do most who game. CCG is a known quantity in the Cardboard Kingdom. If you have ever been to a game store, visited a game site, or even walked through a Barnes and Nobles at a leisurely pace, you have probably bumped bums with something both collectible and cardy. It is this nebulous Collectible Concept that comes from drinking the Cardboard Kool-aid at even the Gateway Level that makes Millennium Bladesa fascinating concept. Not steeped in true CCG-Life I can’t say if Millennium Blades is an accurate CCG Sim – but it certainly relishes in CCG Concept. I bought cards. I sold them. I built decks. I watched them decimate or disintegrate in tournaments. I had a blast and I didn’t care if the guy who spent $500 beat my $5 poor girl deck because it didn’t matter. Paper money isn’t rent money. I may not be a CCGer, but if playing my idea of one (which may indeed be the fuzzy piecemeal idea of one and all it entails) in board game form is as close as I come, I’m fine with that. A bologna sandwich always tastes better when no one is sitting next to you hyperventilating ‘Pikachu’ through their tears anyway. One thing I will say is that Millennium Blades is a game of fictional Power Gamers playing the ultimate faux Power Game, but it might not be the game for certain flesh and blood Power Gamers or at least Power Gamers unwilling to step back and enjoy the fun. While you might be playing and planning to create the Ultimate Deck, can you ever be sure? There are too many cards – too much uncertainty for some. The excess of Millennium Blades can limit access and a Power Gamer might never feel in control or find themselves facing a Nietzschean futility fatality. In crafting order from chaos – it comes down to making the best of what you have, which might not seem like enough. There’s unbalance, there’s overpowered cards and combos which are in the nature of poking the CCG beast in the belly and all in fun – but it might not be the idea of it for a certain mindset. This game OOZES with theme. Everything from the setting to the mechanics buy into the concept of what this is. Made with the whole CCG theme in mind, without the endless money sink. Issues I do have are length of play (it can get a little long) and learning curve. It really takes a bit to get going in it. Best thing about it is the components. Fat stacks of cash to throw around which is the only game I want to have paper money. The card packs look like your buying foil packs. So once again, the simple review is, Love It! Add a Review for "Millennium Blades"